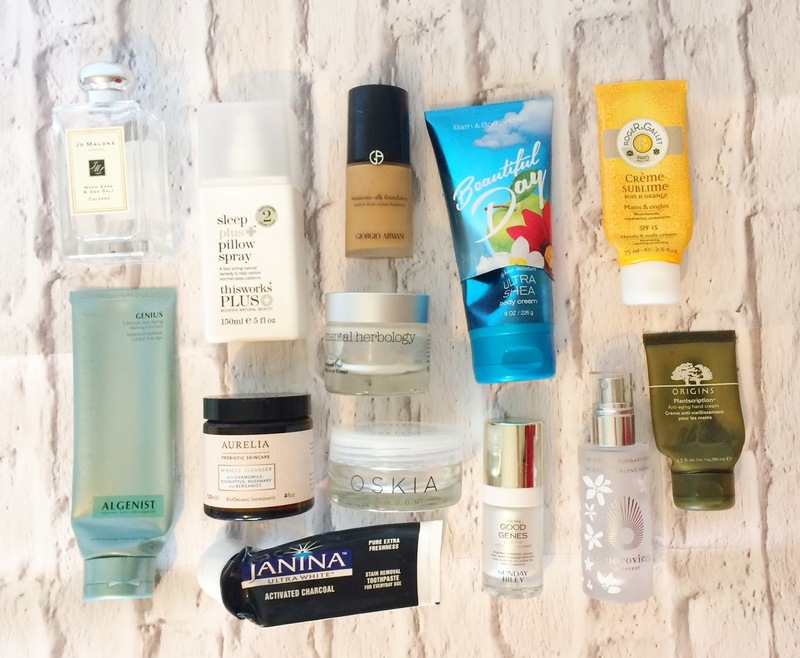 Empties & speedy reviews #29 featuring Jo Malone, Sunday Riley, Oskia, Omorovicza & more! If you're a regular reader, you know the drill but if you're new to these parts then let me explain - I show what products I have finished using in the last month & do a speedy review and then tell you whether I would repurchase! As always, I have a lot of skincare products! Let's get started. Sunday Riley Good Genes: I bought this 15ml bottle in a set, which also included Luna Oil in Sephora in June because I thought it was a great way to try two very hyped up products that had been on my wishlist since they were released, without breaking the bank. I don't mind spending money on skincare but there have been times when I've bought an expensive product only to be disappointed so this set made sense to me. (It's a Sephora exclusive, which is a pain for those of us who don't have a Sephora near us!) Good Genes is an AHA exfoliant, which can be used as a treatment or a mask (I only used it as a treatment). It is 40% Lactic Acid, which sounds quite high - especially for somebody with sensitive skin, but I regularly use Glycolic Acid, which is stronger than Lactic Acid so I took a chance on it. I used this generally as a night serum, before an oil or moisturiser and for me, the results were visible the next morning - my skin looked clear, bright and radiant. I personally wouldn't use it every night because it might be overkill for my sensitive skin as it tingles slightly upon application but I definitely didn't have any adverse reaction to it from using around twice weekly. I also noticed that my pores looked more refined the morning after using this. I had hoped not to fall for it given the price but I absolutely love it. I need to finish a few more products before I can justify buying it as my skincare collection is getting a little out of control, but this will be a definite repurchase. Oskia Renaissance Mask: This is one of the loves of my life! I have raved about this mask on many occasions so I'll try to keep it brief so that I don't bore you, but this mask brightens, softens, refines and deeply cleanses the skin. It is a "one product does everything and more" type of mask and I will forever repurchase it. Read more here. I have already repurchased this! Omorovicza Queen of Hungary Mist: Another product that I have raved about many times before on this blog! It is a very gentle, yet hydrating, mist - so much more than just a facial mist because it actually soothes the skin, yet it can be sprayed over makeup during the day to revive it. It has a fine mist, which is brilliant because it doesn't soak the skin and spray places you don't need it to! It is a glass bottle, so not ideal for on the go but a desk essential. I have a replacement already from the Christmas Introductory Set, which I reviewed here and would highly recommend putting on your Christmas wishlist if you have wanted to try some Omorovicza products for a while. Elemental Herbology Facial Glow Radiance Peel: This is a fast acting AHA exfoliating treatment, which contains fruit enzymes to exfoliate, manuka honey to heal and soothe the skin , vitamins A,C and E for their anti-oxidant properties and bio oils to nourish the skin. I used this when my skin needed a quick pick me up but I didn't have the time to wait for face masks to go their job. This works in 4 minutes and reveals bright and glowing skin, which is soft to touch. I really like this product and will probably repurchase when I finish a few similar products. I've only tried a small number of products from Elemental Herbology but it is definitely a brand that I would like to explore more in the future. Algenist Genius Ultimate Anti-Aging Melting Cleanser: I think that this is a product that deserves more hype - actually, the brand in general, deserves more hype. This is a gel/balm consistency which melts into an oil when massaged into the skin. It is very nourishing and hydrating and leaves the skin feeling very clean but not at all stripped or parched. I really enjoyed using this cleanser and when I finish up some more of my current cleanser collection, this will be repurchased! Aurelia Probiotic Skincare Miracle Cleanser: Another beautiful cleanser - one which I have repurchased 3/4 times already! This cleanser is different from the others in my collection because it is a cream texture, rather than a balm or gel. I never use this to remove makeup, just as an actual cleanser and it leaves my skin looking translucent, calm and even. I adore the scent (it contains eucalyptus, bergamot and rosemary) and tend to use it as my morning cleanse because it is perfect to wake the skin up. The only thing I am not crazy about is that it comes in a pot but I see that they have now released a large size, which comes in a bottle with a pump, so whenever the time comes to repurchase, that is the one that I will go for. Roger & Gallet Bois d'Orange Hand & Nail Cream: I have lost count of the number of tubes of this hand cream that I have gone through. I adore the invigorating scent and I love how moisturising but non-greasy it is. I will definitely repurchase. Origins Plantscription Anti-Aging Hand Cream: This was in a Christmas Gift Set, which I bought in the January sales this year and I kept it in my samples box until recently. It is a really beautiful hand cream - nourishing and non-greasy but I wouldn't normally spend so much on hand creams. I will keep my eyes peeled for a similar set this year & repurchase if I can find it in the sales again! Bath & Body Works Beautiful Day Body Cream: I bought 5 of these body creams when I was in Orlando and really liked all of them - they were moisturising and good value (5 for the price of 3). If they were available to buy here, I would probably repurchase. Jo Malone Wood Sage & Sea Salt Perfume: I almost shed a tear when I finished this perfume because I absolutely love it and Jo Malone perfumes are not exactly cheap! This scent is very different from any other perfumes I own because it is slightly masculine, given that it isn't fruity or sweet at all, but it's not particularly musky either. It is quite difficult to describe but it is woody and very clean and is beautiful worn alone, but also paired with Lime, Basil & Mandarin. This will be at the top of my Christmas wishlist! Giorgio Armani Luminous Silk Foundation: I have worn this foundation on and off for around 7/8 years now. It is the one staple that is always in my makeup collection. It gives medium coverage, which can be built up to full. It isn't overly dewy, but isn't matte. It is long-lasting, doesn't settle into dry patches, doesn't break down around my nose or on my chin and is the one foundation I can always rely on to make my skin look flawless. In case you can't already tell - I love it! I already have a back-up on the go! This Works Sleep Plus Pillow Spray: This is another product that I have talked about a lot on the blog. Take it from me, if you or anybody you know, has problems getting to sleep, staying asleep then this spray is a must for you. Since I started using this spray a few years ago, insomnia and sleep difficulties are a thing of the past - as the name suggests - this works! I know that many people will say that it is expensive but you cannot put a price on a good nights sleep because lack of it affects everything - mood, appetite, energy, motivation. I have already repurchased. Janina Ultrawhite Activated Charcoal Toothpaste: Around 18 months ago, I posted a review of some Janina Teeth Whitening products (here) and it is still one of my most viewed posts so I was delighted when I was sent a parcel of some of Janina's new teeth whitening releases. I want to test each product individually, otherwise I won't be able to tell which one works, so this was the first product I tried. I have to say that compared to the Extra Strength & Super Strength toothpastes, which I have previously used, this toothpaste wasn't very effective in whitening my teeth. My teeth and mouth felt very clean and the product wasn't harsh but there was very little difference in terms of whitening, whereas when I used the other toothpastes in the range, there was a very definite difference. All brands are bound to have one dud and for me, this is it but I have already started to use the next product they sent me and I am seeing a difference already so keep your eyes peeled for a review soon! Have you tried any of these products and what were your thoughts on them? What products have you finished up recently? I would love to hear your thoughts in the comments below!